The Mint operates four production facilities in Philadelphia, Denver, San Francisco and West Point, a bullion depository in Fort Knox, and a head office in Washington D.C. The United States Mint (US Mint) is the official government operated mint of the United States of America. In the precious metals world, the US Mint is probably best known for two reasons. Firstly, the US Mint produces the very popular American Eagle gold bullion coins and American Eagle silver bullion coins. Secondly, the US Mint oversees the storage and custody of the United States official gold reserves on behalf of the US Treasury, most notably at the Fort Knox bullion depository in Kentucky. Beyond these functions, the US Mint also manufactures US legal tender circulating coinage, as well as commemorative coins, proof coins, medals, and other numismatic coin products. In fact, the US Mint is the world’s largest manufacturer of coins and medals, as well as the world’s largest producer of gold and silver bullion coins. Although the US Mint is headquartered in Washington DC, its production facilities are based in four other locations across the US, namely Philadelphia, Denver, West Point in upstate New York, and San Francisco. The Fort Knox facility in Kentucky is exclusively a bullion depository and not a production facility. West Point and Denver also provide bullion depository and storage facilities for part of the US Treasury’s gold reserves. The history of the US Mint has close parallels the history of gold and silver in the United States. The US Mint was established on 2 April 1792 by an Act of Congress which declared that “a mint for the purpose of a national coinage” be established. In 1792, the US Coinage Act also defined a dollar as equivalent to 371.25 grains of silver, while setting the proportional value of gold and silver at 15 to 1. The same year, the US Mint’s first coin minting facility opened in Philadelphia. As the Mint’s volumes expanded, many of the early production facilities were built at locations close to US gold discoveries. For example, a mint facility was established in Dahlonega, Georgia in 1838 following gold discoveries and the subsequent Georgia gold rush which had began in 1828. Similarly, a minting facility was set up in Charlotte in 1837 to facilitate assaying and minting of gold resulting from the 1820s North Carolina gold rush. The San Francisco mint, which opened in 1854, also owes it’s genesis to the discovery of gold in the Sierra Nevada mountains in California in 1848 and the subsequent legendary California gold rush. The US Mint established its Denver facility in 1862, initially as a precious metals assay office in response to the Pike’s Peak gold rush in Colorado. One of the most important and busiest assay offices run by the US Mint over its history was the US Assay office in Manhattan, New York. This facility opened in 1954 but closed in December 1982. While many of the US Mint’s minting facilities and assay offices have opened and closed over time two of the Mint’s current and most high profile facilities were only established in the 1930s. The US Mint’s West Point bullion facility opened in 1938 on land formerly occupied by the West Point military facility that was deeded to the Treasury Department. The Fort Knox bullion depository opened in 1936 on land that was previously part of the Fort Knox military base. This land was also deeded to the Treasury Department. Both of these facilities are said to store US official gold reserves and both have the added security of being adjacent to US military installations. The US Mint is part of the US Department of the Treasury. The Treasury Department is structured into various divisions known as ‘Offices’, one of which is the Office of the Treasurer. The Mint is headed by a director who reports to the Office of the Treasurer. Although the Mint became part of the Treasury Department in 1873, it was only in 1981 that the Office of the Treasurer took over supervision of the US Mint. This Office of the Treasurer also oversees the Fort Knox bullion depository. In turn, the Treasurer reports to the Deputy Secretary of the Treasury, who reports to the Secretary of the Treasury. Currently, the position of the Director of the US Mint is vacant, and the director’s office is run by the Principal Deputy Director, Rhett Jeppson. The Mint Director’s position has been vacant since Edmund Moy resigned in 2011, after which a subsequent presidential nominee failed to be appointed by Congress.. The US mint has 1,600 employees, and since 1996 has operated under a system called the Public Enterprise Fund (PEF) US Code 5136, under which is generates its own revenues and doesn’t need funding (appropriations) from the US Federal Government. US Mint revenues are derived from selling circulating coins to Federal Reserve Banks and branches, selling precious metals coins to Authorised Purchasers (see below), and selling proof coins and numismatic products to the public. Excess revenue not required by the US Mint PEF is transferred to the US Treasury’s General Fund. Bullion coins refer to investment-grade precious metals coins that are non-circulation, non-proof coins. Bullion coins are produced in unlimited quantities depending on demand and also depending on availability of metal supply and/or coin blank (planchet) supply. US Mint bullion coins are produced under the Mint’s bullion coin program which comprises American Eagle Silver bullion coins, American Eagle gold bullion coins, American Buffalo gold bullion coins, America the Beautiful silver coins, and American Eagle Platinum coins. Each of these coins is specifically covered by US legislation which authorises the US Treasury Secretary to issue the coins, codified as Section 5112, Title 31 of the US Code. American Eagle silver coins have a 99.99% silver purity, are only produced in the 1 ounce denomination, and are the best selling 1 oz silver coin in the world. Silver Eagles were first issued in 1986 and were authorised for production by the Liberty Coin Act of 1985. American Eagle gold bullion coins are a 22 karat gold coin (i.e. 0.9167 pure gold) containing exactly 1 ounce of pure gold. They are produced in four denominations of 1 oz, 1/2 oz, 1/4 oz and 1/10 oz. Gold American Eagles were first issued in 1986 and were authorised by the Gold Bullion Coin Act of 1985. American Eagle platinum coins are 1 ounce denomination .9995 fine platinum coins that were first issued in 1997. American Buffalo gold coins are 24 karat (.9999 fine) gold coins, first issued by the US Mint in 2005. America the Beautiful silver bullion coins are a series of 5 ounce .999 fine silver coins which replicate the designs found on the US Mint’s America the Beautiful series of quarter-dollar coins. The US Mint is authorised to issue a palladium bullion coin but has never done so. In 2010, Congress enacted the “American Eagle Palladium Bullion Coin Act of 2010” which allows the Mint to produce a .9995 palladium American Eagle. The Treasury Secretary is authorised to issue a 1 oz palladium coin under paragraph (12) of Section 5112 (1) (a) of Title 31. The reason the Mint never issued a bullion palladium coin is that a feasibility study conducted by CPM Group on behalf of the Mint found that a bullion palladium would be unprofitable due to insufficient demand. In 2015, the US Mint generated revenues of US$2.125 billion on its bullion coins sales, with silver and gold Eagles representing the majority of this segment. Revenues from silver Eagle sales totalled $785.4 million in 2015, while gold Eagle revenues totalled $979.6 million. American Buffalo gold coins sales added another $252.2 million in revenues. Platinum Eagle and America the Beautiful silver coin sales are both much smaller contributors to bullion revenue, due to their lower production and sales volumes. The US Mint publishes regular updates about its bullion sales on its website. These figures are closely watched in the precious metals industry since they act as a gauge of physical precious metal demand sentiment. The five bullion coins in the US Mint’s bullion program (i.e. American Eagles, American Buffalos, and America the Beautiful silver coins) are sold exclusively to Authorised Purchasers by the Mint at a price which reflects the cost to the Mint of sourcing the precious metals plus a premium to cover fabrication and operating costs. In turn, the Authorized Purchasers are expected to make a two-way market in the coins so as to provide market liquidity to the global customer base which comprises precious metals dealers all over the world. Further information about these four companies can be found in BullionStar’s Gold University coverage of the US Gold Market. Additional Authorised Purchasers that featured on recent lists include HSBC Bank USA, Prudential Securities, Fidelitrade, APMEX, Commerzbank and Deutsche Bank. The US Mint acquires its precious metals supply from a small number of approved sellers, one of which is Coins ’N Things, which on occasion has had large contracts to supply the US Mint with gold. Other approved sellers of precious metals to the US Mint include Sunshine Minting, Spectrum Group International, and Cookson (Stern Leach). The USA claims to have 8,133.5 tonnes of gold in its official gold reserves. This would make the US the largest official gold holder in the world. There is much written about the US official gold reserves, and also much skepticism as to whether the US actually has the official gold reserves it claims to have. This skepticism arises due to the US never having allowed a full independent audit of its gold holdings, and the fact that the London Gold Pool collapsed in March 1968 specifically because the US ran out of Good Delivery Gold to supply the London Gold Market. The August 1971 suspension of the US dollar’s convertibility into gold for official central bank holders was another sign that all may not be as it seems when it comes to reported US official gold holdings. 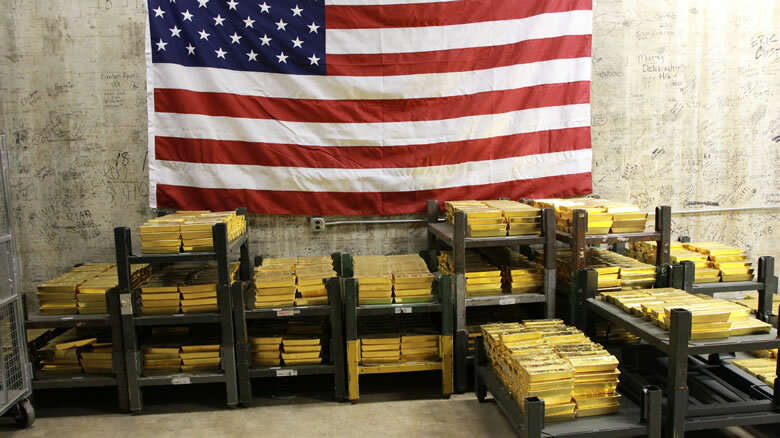 The US Treasury claims to own 8133.5 tonnes of gold, 4582 tonnes (147.3 million ounces) of which are stored in the US Mint bullion depository in Fort Knox, Kentucky, 1682 tonnes in the West Point bullion storage facility in upstate New York, and 1364 tonnes in the US Mint facility in Denver, Colorado. These three storage facilities together total 7628 tonnes of gold. The US Treasury claims that it stores the remainder of its official gold reserves at the Federal Reserve Bank of New York (418 tonnes) and also as working stock for the US Mint (87 tonnes). For more information about US Treasury gold, see BullionStar blog articles “Where Did The Gold In Fort Knox Come From? Part One“, and “A First Glance At US Official Gold Reserves Audits“. The US Mint’s headquarters in Washington DC provides administrative and supervisory services for the entire Mint group. Bullion coins and numismatic coins are predominantly produced at the San Francisco and West Point facilities, with West Point producing gold and silver coins, and San Francisco specialising in silver coins. Circulation coins are manufactured in Philadelphia and Denver. Coin design, sculpting, engraving and coin die production are done out of the Philadelphia office. Commemorative coins are manufactured in San Francisco, Denver, West Point and Philadelphia. Fort Knox is solely a bullion depository. West Point and Denver also store gold bullion.